At Greenfire Farms we’ve embarked on an ambitious project to create a tolbunt Orpington. 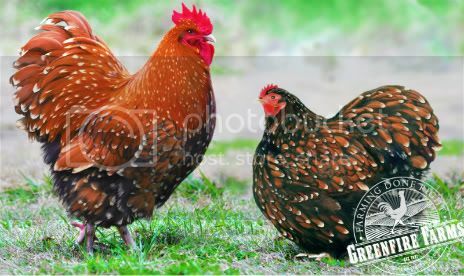 If you’ve been to the tolbunt Polish page on this website you know that ‘tolbunt’ is a recently created color pattern from the former East Germany that combines brown, black, and white to dazzling effect in the feathers of a chicken. The tolbunt pattern is derived from a multi-generational breeding program that begins with the gold laced and mille fleur color patterns in the first generation of parents. What might a tolbunt Orpington look like? We posed that question to renowned Dutch artist and chicken geneticist Sigrid van Dort who masterfully imagined and painted this pair of tolbunt Orpingtons. We hasten to add that the tolbunt Orpington does not currently exist. This is simply Sigrid’s excellent rendering of how such birds might appear. If you want to see more of her writings about chicken genetics and her remarkable paintings, go here. We are years away from producing a real tolbunt Orpington in the flesh, if at all. And yet, the pieces of our tolbunt project are in motion. As luck would have it Greenfire Farms imported the first gold laced and jubilee (“jubilee” is a catchier name for mille fleur) Orpingtons into the United States. So, possessing the basic building blocks for the creation of the tolbunt color pattern in Orpingtons, we selected a couple of our best-patterned jubilee Orpington hens and an outstanding gold laced Orpington rooster. These birds almost immediately began producing remarkably robust chicks. We’re raising about 40 of these cross-bred chicks, and in the fall after they molt will select the best-patterned birds for breeding in 2013. We hope –but are not certain—that after about four generations of breeding we can hatch at least a few birds that grow to look like the birds pictured here. Only time will tell. But, we will keep you in the loop as this multi-generational project plays out. With any luck one day the images in this blog post will leap off the screen and turn into living, breathing chickens in your backyard.